HeyPlantMan! Exotic Tropical Plants from St. Pete FL: Sat. 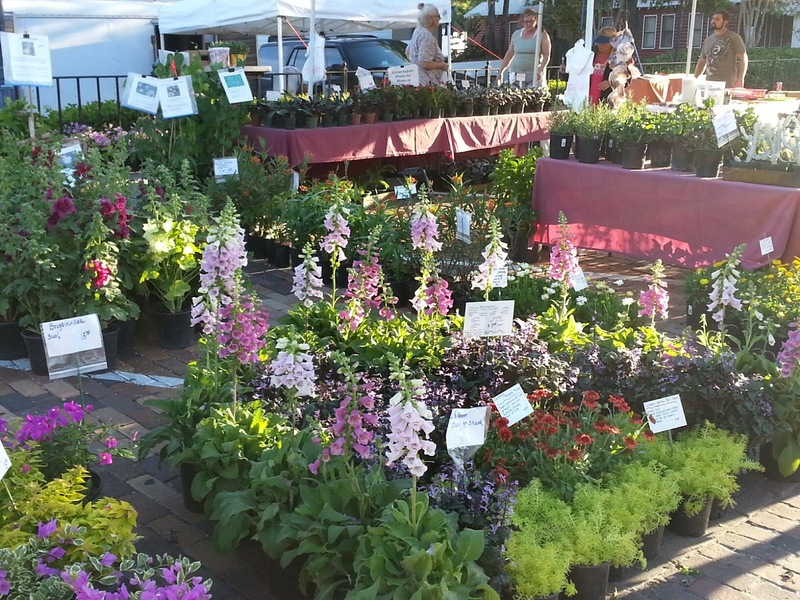 Market this weekend - Green Thumb Festival next weekend ! Sat. Market this weekend - Green Thumb Festival next weekend ! This past month has been a whirlwind of Market and Botanical Shows around the state and we have been busy as bees. Last weekend we set up at Spring Fever in The Garden, historic downtown Winter Garden and had a fab time...great crowds, great sales and just an all-around great show to be at. We took 2 truck-fulls over there and came home with very little, so we must be doing something right ! So, this weekend, we are back at our home base of the Saturday Morning Market, downtown St. Pete, and we are also busily preparing for the Grandaddy of all Spring shows in Central Florida, the Green Thumb Festival, here in St. Pete next weekend. So, should you wait for Green Thumb festival to buy our plants ? Certainly not ! At market this weekend, we will have a preview of some of our glorious plants - and you don't have to fight the crowds, and you get "first dibs" so to speak ! That being said, yes, we have a fab display for Market tomorrow, but I don't want to get you too excited, but we think we are going to have the best-ever display at Green Thumb. All our hardy spring and summer perennials, HOLLYHOCKS galore, exotic tropicals etc will be showing themselves off at market tomorrow. As for Green Thumb, we are pulling all the stops out to bring you the best, the healthiest, the most unusual and we will have some surprises ! Here's the scoop - Market is open tomorrow, Sat. from 9am-2pm - look for Armstrong Nursery on the back East row of market - just look for all the color. First, besides us, there will be many of your favorite market vendors at Green Thumb, so seek them out and see what new they have for you. Second, Bring your CARTS ! - DON'T mean to shout, but it's important, because we know you will see lots of great stuff to buy and need to get it to your vehicle. Carts can be anything from a fancy garden cart, to wheelbarrows etc, use your imagination. That being said, you will find many young enterprising kids with carts to help you -just give them a nice tip and they will help you out. Note: We only allow the young kids associated with us to help collect your purchases ,and take them to the main entry of the big parking lot, where you can drive up. They are not allowed to go out into the far reaches of the parking lot, for their own protection. Third, get there early, if you can ! The best stuff gets picked up early, but wise vendors such as us, continually stock our booths throughout the day, and again on Sat. evening, so Sundays, you will still find great plant stock and items. It gets crowded, be patient, have fun and don't forget to keep hydrated and fill your tummies with yummy foods from the Food Court area. 4 - There are limited bathrooms in the Center building itself. There is air-conditioned portable bathrooms down by the food court - much nicer ! 5 - Make the rounds of the vendors but don't forget the many non-profit and city informational booths, as well as plant auction areas. 6 - Most booths, such as ours, take cash or credit cards - we do not take checks. There will be an ATM located at the show. 7- Have fun, stop by and visit, stop by and buy ! We usually have anywhere from 8-10 people assisting in our booth and our aim is to serve customers promptly, educate about our plants and have you walking away with a smile.